The ruling People’s National Congress (PNC) Party in Papua New Guinea is on track to returning to power if the early poll results are any indication. The declaration of its senior members James Marape in Tari-Pori and Justin Tkatchenko today in Moresby South set the pace as their party leader Prime Minister Peter O’Neill leads the count in Ialibu-Pangu. It’s too early to comfortably forecast the outcome because of the limited preferential system but as it is PNC members are in the top five counting which started in earnest in at least 19 electorates across the country. PNC is leading with 17 candidates making up the top three in progressing counting electorates, National Alliance is second with 11, People’s Progress Party (PPP) 5, Pangu 3, PNG National Party 4 and independents 10. These are figures of parties that are running first, second and third on each counts across the country. Marape was the first to be declared on Sunday, with Tkatchenko to be declared today. Party Leader Peter O’Neill is leading comfortably with 13510 votes after count 29 with rival Stanley Liria running second on 2444 votes while other candidates Leonard Pangepea with 281 and Dr Sam Kari 204 votes respectively. PNC candidate Philip Undiala is leading the Hela Regional seat after count 146 with Philip Undialu on 29 548, followed by Dr Hewali on 20 157, Francis Potape on 16 946, Andy Kenamu -14,802 and Larry Andagali trailing on 13556. PNC Party has taken the lead in Manus with incumbent Charlie Benjamin leading in the Regional count and Job Pomat leading the Manus open seat. 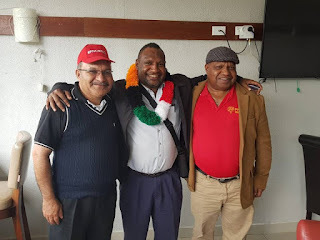 PNC has also taken the lead also in Milne Bay with Charles Abel and Douglas Tomuriesa for Kiriwina-Goodenough open and Sasindran Muthuvel in West New Britain regional. The next political party that must be watched closely is National Alliance Party that has started a battle on New Ireland Province with president Walter Schnaubelt leading with 9291 votes against incumbent Byron Chan in Namatanai and Michael Singan challenging giant and incumbent Governor Sir Julius Chan. National Alliance party leader Patrick Pruaitch is running for Aitape Lumi with counting expected to get underway when polling winds down today. NAP is leading in Goroka Open a party that have the experience in winning elections and forming governments and Malakai Tabar is leading in Gazelle Open on 2249 votes. Pangu Party leader Sam Basil has taken the lead in Bulolo Open whole Kennedy Wenge leads in Nawaeb Open in Morobe. The next closest group are the independents who are leading in 10 seats. Following them are former coalition partners People’s Progress Party who are leading with four seats. Don Polye’s THE party has had a very disappointing start leading in just three seats. Projected numbers at this stage and according to current trend in voting tally PNC may claim more than 35 seats.